The grand Scenic is just 21 centimetres longer than it’s little Brother. It doesn’t sound like much but is enough for Renault to fit in an extra two seats to turn this into a seven Seater MPV. The scenic has been around for quite a few years. In fact it could be argued that Renault created the medium sized MPV Market. This model dates from 2009 but has had a facelift in 2012 adding front led daylight lights and better fuel economy on the Tom Tom Dynamique model. There are three individual sliding, tilting chairs in the middle row with enough space for three adults and plenty of head room. The boot seats in the Scenic fold flat. 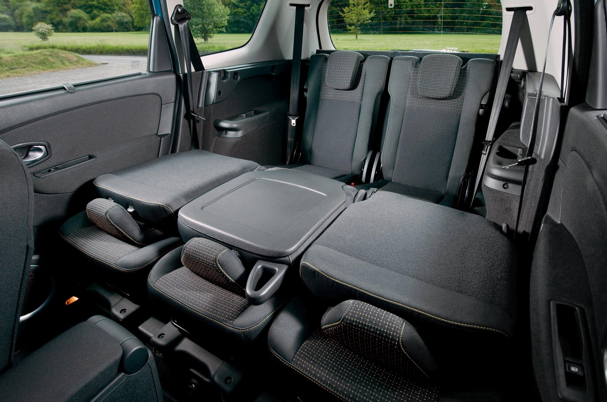 Even the front passenger seat folds down but the Renault Grand Scenic suffers from the same issue as the Volkswagen Touran in that the middle row seats don’t fold flat. Many of the new batch of rivals in this mid sized MPV market have adopted fold flat seats throughout which enables you to create a large flat loadspace which is great for moving large objects. But in this car the middle row when folded are higher and whilst you can remove them entirely if you want, they are heavy to lift and awkward to re-fit. Plus you have the problem of storing them whilst they are not in use. 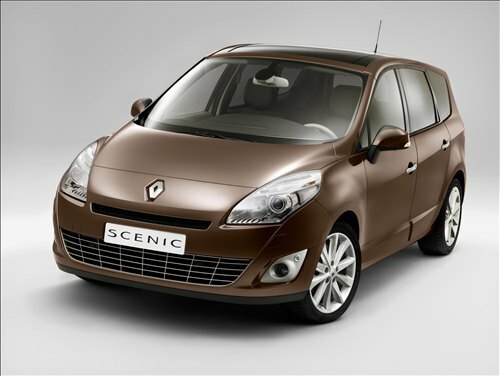 The 2012 Renault Grand Scenic has a new petrol engine: the 1.2 TCe which has much improved performance and fuel efficiency over the old petrol engine: the 1.6 VVT 110 which is a 1.6 litre engine producing 110PS. The 1.2 TCe has a 0-60 mph time of 12.6 seconds, a top speed of 112 mph and miles per gallon figure of 46.3. However the range of diesel engines Renault offer is outstanding giving you great performance and class leading fuel economy. There is the 1.5 DCi which returns 57.6 mpg while having respectable performance, transporting you to 60 in 13 seconds. The diesel of choice is the 1.6 DCi which returns over 68 mpg combined and gets to sixty miles per hour in just over 11 seconds and tops out at 121 mph. Unfortunately it is also the most expensive engine in the range. 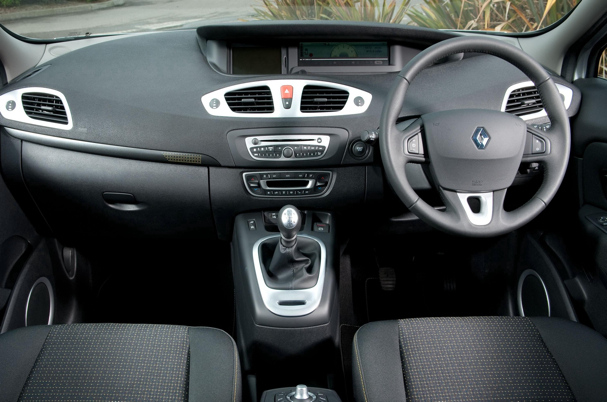 Getting in the drivers seat is a nice experience in the Renault Grand Scenic. You sit up high with a great view out over the road ahead. 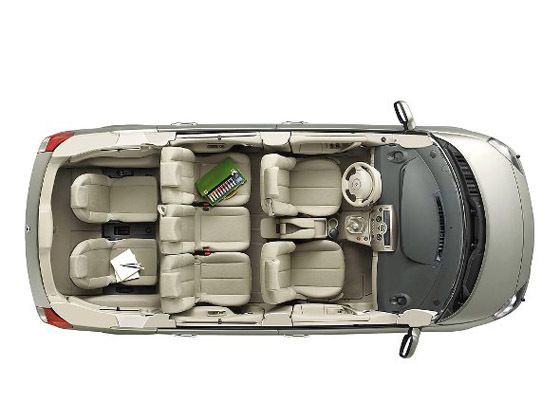 There is plenty of space and the seat is very adjustable so you are bound to find a comfortable driving position. The dashboard is curving and very modern looking and has a quality feel to it. Driving the Grand Scenic is more like driving a car than an MPV. The firm suspension means this car doesn’t roll round corners and grips to the road. Renault has put a lot of effort into safety and goes beyond what buyers will see on most seven seater cars. The front airbags come with intelligence to deploy just as much as is needed in a collision and there are curtain airbags along the whole length of the car to protect the rearmost passengers as well as those in the first two rows. Stability control is standard on all models in the range. There is no wonder then that the Grand Scenic achieved the maximum five star Euro NCAP rating. Despite the firm suspension it is a comfortable car to be in. With comfortable seats for all passengers journeys will pass with ease. The curved dashboard gives even more space for the driver and front seat passenger. Renault’s reputation for reliability has taken something of a battering in recent years and if the 2011 JD Power survey is anything to go on things haven’t massively improved. However, this is an update model for 2012 so hopefully Renault have dealt with some of the issues and all cars do come with a four year warranty. Every Renault now comes with the 4+ package which includes a four year warranty, four years servicing, four years at home road side assistance package with the AA which will help to significantly lower running costs. The diesel engines on the Grand Scenic are also very economical with the 1.5dCi returning 68 miles per gallon. This engine puts out 105 CO2 / km which means it is in VED tax band B with a yearly cost of £0. The Renault Grand Scenic has so many positives that if Renault could seriously address the problems with this car then they would have one of the best seven seater MPVs on the market. This is a good car to drive, has a good amount of space, excellent engines and competitively priced. It is let down by the lack of fold flat seating and a difficult to shake off reputation for reliability.